The Bell Warriors Football Club offers amateur football programs for boys and girls between the ages of 7 and 23. The Club has been in existence since 1955, with a team in the Pee Wee division. As the league expanded, so to did the Warriors. Our territory includes Bells Corners, Crystal Beach, Bayshore, Britannia, Stittsville, Richmond and Munster. Our organization stresses skills development, sportsmanship, and the value of teamwork. Over fifty volunteers help us to attain these goals through their efforts as club executives, coaches, conveners, event organizers, canteen and bingo workers. Without their help, the Club would not be able to function. To register for one of our clinics, special events, non-contact programs or tackle programs, Click Here. Each NCAFA (National Capital Amateur Football Association) tackle club has a territory. You can find out which club’s territory you reside in by going to NCAFA Interactive Maps. There are no territories used for the NCAFA Girl’s Touch Football program. The Warriors supply 100% of the required player equipment. We spend approximately $30,000 annually to purchase, recondition and re-certify player equipment. Player safety is of the utmost of importance to the Warriors. All you will need to supply is a pair of cleats. 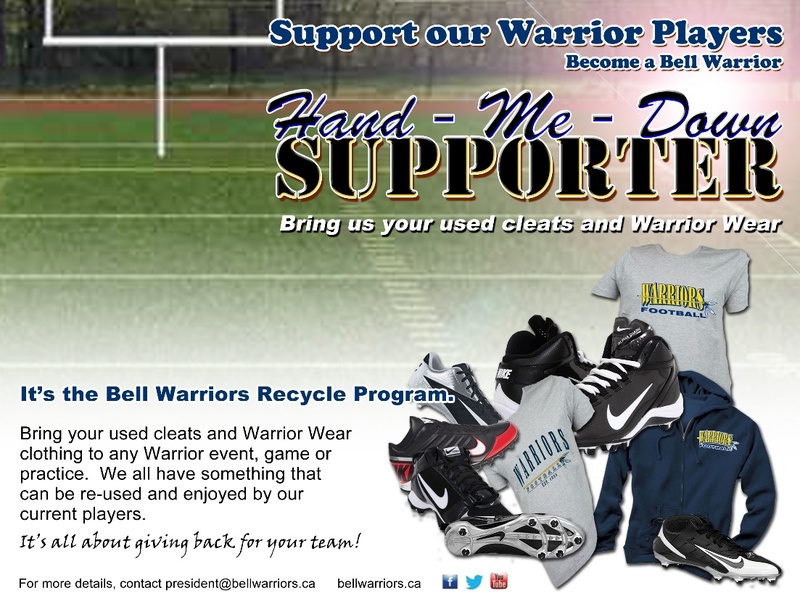 You may also want to take advantage of our cleat recycle program – the Warriors Hand-Me-Down Program. More details about fees can be found on our Registration Page. Tackle Programs range from $300-$350 (which includes a small tryout fee to cover the cost of helmet reconditioning). Girl’s Touch Football is ~$175 and Winter Workout Football Clinics are $40.